After two years trading, two-person, white glove home delivery and in-room installation company Keen & Able, is relocating its head office to Northampton, creating 50 new jobs and a new national distribution centre in the process. In addition to this, Keen & Able has announced it will also be setting up a smaller regional distribution centre in Manchester. With plans to be operational by the 20th October, it will service the Northwest and Scotland thanks to its practical location, with the 23,000sq.ft. unit creating 20 new jobs for the area, and bringing the total jobs created by the business to 70. The success of the past two years will see the company, which specialises in mattress and bed installations for retailers and manufacturers, move its head office from Long Eaton to a national distribution facility in Northampton on the 5th November. This new space measures 40,000 sq. ft., and will enable the business to fulfil deliveries around the UK due to its strong central position. Deliveries will be made seven days a week throughout the day and also through evening slots. Thanks to all this extra space, Keen & Able has also been able to launch its extended storage service, which has been designed to help save its customers the hassle and cost of holding stock. The company also provides the option of directly receiving goods straight from the docks for an easy and efficient drop shipping service for its retailers and customers. Keen & Able’s Managing Director, Chris Knight, places this continued success on its exceptional customer service, for which the business has maintained an average 98% satisfaction rate over the past two years, along with an industry leading 9.7 score on Trust Pilot. “It’s great to see how far we’ve come since starting the business in 2016 and it’s testament to the hard work of everyone involved that we’ve grown this much in such a short space of time.” said Knight. “Moving to a larger head office and setting up a new distribution centre allows us to focus on delivering a truly national service which is underpinned by strong customer service. By extending our facilities we have created extra storage that allows us to meet the increasing demands of our existing customers who continue to expand their own businesses. Keen & Able takes its green credentials very seriously. All packing materials are taken away after delivery and recycled, so the customer has nothing to dispose of. It also offers a convenient recycling service for mattresses and beds - ensuring 100% landfill avoidance. 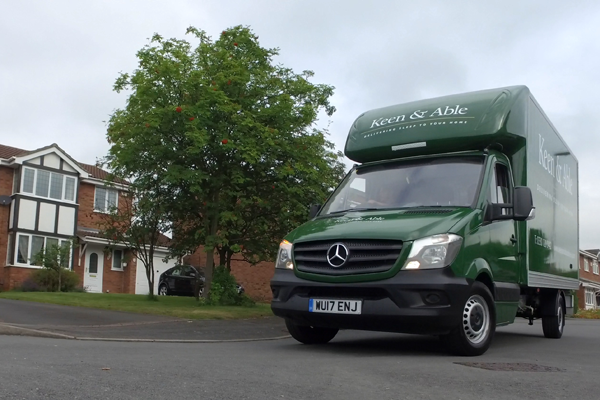 In addition, it operates a modern, well maintained fleet and every route is rigorously planned to minimise the amount of time its vans are on the road, providing benefits for the retailer and their customer.